The following interview was taken from a blog post by Lifebox. Mark your calendars! A busy week for safer surgery in Armenia, starting Sunday as the ‘Safety in Surgery and Updates of Obstetric Anaesthesia’ conference comes to Yerevan. The Armenian Society of Anaesthesiologists and Intensive Care Specialists (ASAICS) is joined by Kybele, Inc in the capital city, for refresher training with all eyes on a safer future for providers and patients across the country. Lifebox is thrilled to support the workshop with training materials and the donation of 100 pulse oximeters. Safer surgery can’t bring back women and babies lost in childbirth, but it can change the world for future generations. 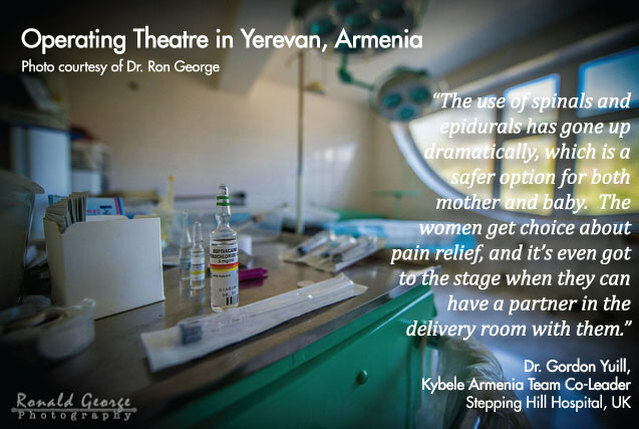 Kybele first went to Armenia in 2006, and then in 2010 we signed a 5-year collaboration with the anaesthesia association. The aim was to increase the use of regional anaesthesia in obstetrics, and to produce national guidelines that would help get every hospital in the country to national standards. The doctors were so encouraging and welcoming. They’re so proud of their country, but they could see how Yerevan, with a third of the population and the best hospitals, could offer a higher standard of care. They wanted to bring other hospitals in the country up to the same standards as the capital. That was really on their hearts – safer anaesthesia not just for the lucky few, but across the whole country. What difference do you think this conference will make? When we first started working together, we focused on clinical improvement, technique and post-operative pain management. And we’ve seen some fantastic changes! The use of spinals and epidurals has gone up dramatically, which is a safer option for both mother and baby. The women get choice about pain relief, and it’s even got to the stage when they can have a partner in the delivery room with them. Now, this conference is looking beyond clinical practice: to a greater awareness of safety and quality in surgery and anaesthesia. There’s not much qualitative information available, so we’re also working together to understand the importance of collecting data for more reflective practice. What difference will the Lifebox oximeters make? When we were sending out the needs assessment last year, there was such excitement – really jumping around, thinking about what we’d be able to achieve. We didn’t think we’d get near 100 oximeters! The vice president of ASAICS was calling his friends, talking about what this could do for the country. They’ll make a big difference in that every patient should be wearing one now – both in theatre and recovery. The neonatal probes will also make a big difference for the most vulnerable new patients. The Armenian society was really keen on developing national guidelines for obstetric anaesthesia, and after a lot of work together, they were published just in February – amazing! Pulse oximetry is part of those guidelines, approved by the Ministry of Health. Ultimately the oximeters contribute to increasing standards, improving safety – it’s positive, across the board. Why is safe surgery a priority? Well for Kybele – our tag line is ‘for safe childbirth worldwide.’ It’s really all there. We’re working to improve quality and safety, which means working with colleagues to raise the minimum standards. One of those is obviously pulse oximetry, and to give one for every patient is a massive achievement. For the Armenian society – it’s really the same, isn’t it. It’s all about quality and safety, about providing the same opportunities for their patients and their profession as you’d find elsewhere in the world. For them, for the public – it’s also about trust. If you know you’ve got a certain standard of quality you can go to any hospital and trust the providers with your body, your care, your child. Because you know that these minimum standards exist and the equipment is there to drive it. So is this your last year working in Armenia? No – the 5 year collaboration is ongoing!